This entry was posted on Wednesday, March 31st, 2010 at 1:57 am	and tagged with Chanson de Roland, Dante, Dante Divine Comedy, Dante giant, Dante pride, Dante's Inferno, Divine Comedy, inferno, Nimrod and posted in Inferno, Uncategorized. You can follow any responses to this entry through the RSS 2.0 feed. Once again insights into the poem I never considered before. Thank you, Jeff. Virgil definitely represents “reason personified.” And the Titans/Giants are, in many ways, here seen as the antithesis. The fact is that many of the classical myths (and later folk tales about giants) focus on the danger of the combination of great size and intelligence as a great danger to gods, man and the world itself. That is why the Olympians so feared the Titans and giants were generally cast in the role of evil beings. And yet, Dante uses giants as barely reasoning prison guards. Why? It was often the case that gods of older religions became the demons/devils of the newer ones. This happened in early and medieval Christianity. Therefore, it was not really unusual for a poet like Dante to take giants of classical mythology and place them as the guards of the ninth circle. Nor is it surprising, under the circumstances that they are not really keeping anyone out, but rather are keeping someone/thing in. And, doing a good job of it. Dante mixes the classical Titans and giants together with Biblical giants. He cuts them from the same cloth. Biblical and Classical gigantism become mixed. Giants were, in fact, referred to at times in some versions of the Old Testament as Nephilim. The Nephilim (seemingly supernatural beings or at least the progeny of supernatural beings) have been identified with the “Giants of Canaan” in Numbers 13:33. And, of course, there is Goliath (1 Samuel 17). 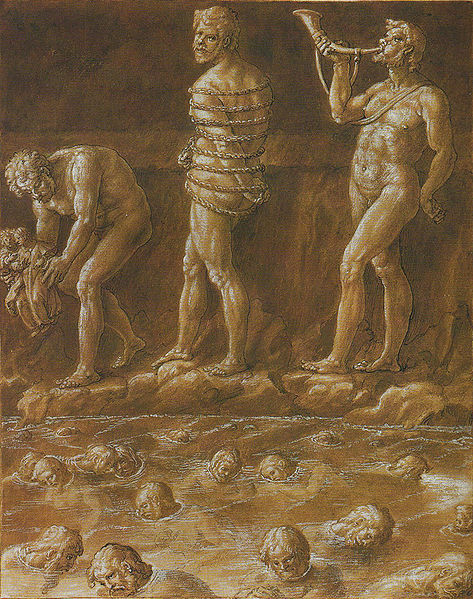 The Titans Ephialtes and Antaeus are definitely of Greek rather than Biblical origin, as was the giant Briareus, who Dante’s pilgrim was seeking (Hesiod certainly considered him to be giant, rather than a Titan). Nimrod is a Biblical figure, though as an Assyrian king, who was transmuted by Dante into a Titan. Nimrod had, however, been associated with the Tower of Babel long before Dante’s time. “In Dante’s medieval epic Milton found precedent for linking the fall of giants with the fall of Satan.” Both Milton and Dante make similar references to gigantomachy (see George F Butler’s ‘Giants and Fallen Angels in Dante and Milton’). Who better to guard Satan in his pit, than they? In addition to the “lack of reason,” we find Pride – perhaps the greatest sin of all, underlying all sins. Pride [hubris] is seen here in all three ‘Titans’: in Nimrod, who built the Tower and in Ephialtes, who dared to rebel against the Olympian gods. But, especially we find Pride in Antaeus, who is tricked by Virgil’s praise for his abilities. As a result, Antaeus hand-carries Virgil and Dante down to the last circle (142,143). That is how you get a giant to kneel! No humility here. No Grace. It was Roncesvalles all over again. Such interesting information, insight and research, Bob. Love it. I also have to mention how interesting – strange, coincidental…? – it was to go and see “Clash of the Titans” this past weekend. (I was a bachelor until Saturday, when Catherine and Will returned home). This film – a remake of an earlier one made in 1981 – explores this same territory. All those interested ought to go see it – not so much for its artistic or intellectual freight, as for the sheer entertainment value…. In any case – been So good to have you along for the ride, Bob!